The 2014 Nedbank Tour de Tuli has been lauded a resounding success, once again living up to its reputation as one of southern Africa’s premier mountain biking events. 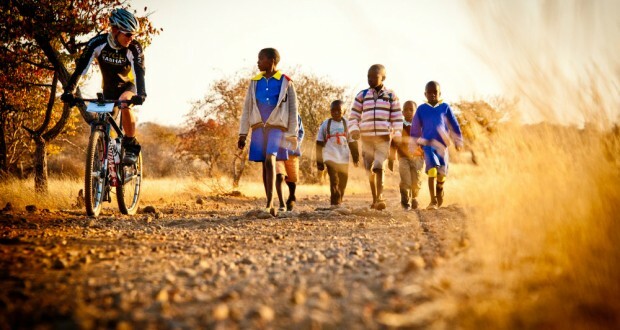 Organised by Children in the Wilderness (CITW), the 10th edition of the event saw 340 participants cycle across over 250 km of challenging and remote terrain in Botswana, Zimbabwe and South Africa between 1 and 6 August. “While traversing national parks and manoeuvring through some technical sections, participants were rewarded with plentiful elephant sightings and spectacular scenery”, said Nicola Harris, Tour Director. The Tour started at Pont Drift border between South Africa and Botswana, followed by two days of exploring the Northern Tuli Game Reserve on ancient elephant trails. From here, cyclists crossed the Shashe River and entered Zimbabwe’s Tuli Circle with a further two days spent cycling through communal areas and expansive bushveld. The final day saw riders wade across the Limpopo River into South Africa’s Mapungubwe National Park and over the finish line. “While the magnificent landscape continues to amaze cyclists year after year, one of the high points was the opportunity for cyclists to meet with some of the communities that CITW works with and witness first-hand how funds raised from the Tour make a difference in their lives”, said Dr Sue Snyman, CITW Programme Director. Cyclists received cheers and a warm welcome as they cycled through Lentswe-le-Moriti in Botswana on Day 1, and an equally rapturous reaction on Day 3 when they rode through Limpopo Village in Zimbabwe, donating backpacks and notebooks at a local school before stopping at a tavern to interact with locals and other riders. All funds raised by the Tour are channelled directly into CITW, a non-profit organisation that runs sustainable education programmes to bridge the divide between communities and the wildlife areas they live next to. Over the last 10 years, the Tour has hosted 2,369 cyclists and raised R11.6 million for CITW. The Nedbank Tour de Tuli is also a cross-border tourism success story, with the governments of Botswana, Zimbabwe and South Africa working closely together to ensure a seamless experience for participants, and in doing so, raising awareness of the importance of Transfrontier Conservation Areas. This year, cyclists and organisers were honoured to have Botswana’s Minister of Environment, Wildlife and Tourism, Tshekedi Khama, not only open the event, but also don a helmet and ride the first stage of the Tour. During the official opening ceremony, the Minister emphasised the important role that ecotourism plays in creating sustainable livelihoods for local community members. He added that eco-sensitive events like the Nedbank Tour de Tuli serve as a catalyst for the ongoing protection of wilderness areas.